Trigonometry is a branch of mathematics which deals with triangles, particularly triangles in a plane where one angle of the triangle is 90 degrees (right angled triangles), and a variety of other topological relations such as spheres, in other branches, such as spherical trigonometry. It specifically deals with the relationships between the sides and the angles of triangles; the trigonometric functions, and calculations based upon them. 100% of 43 reviewers would recommend this app. don't dwnld it. It's fake for nokia e5. 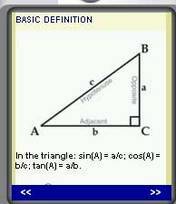 Download app for mobiles TrigonometryDownload app for mobiles - one of the best Java Applications for free! You will certainly enjoy its fascinating features. At PHONEKY Free Java App Store, you can download mobile applications for any Java supported mobile phone free of charge. Nice and usefull features of this app will keep you captivated for a very long time. At PHONEKY, you will find many other apps and games of different genres, from Education and Entertainment to the Security and Navigation Java apps. To see the Top 10 best Java software for mobile phones, just sort apps by popularity.